1. Limited to two (2) mail in rebates offer per person, household, or address. Offer requires a purchase of four (4) qualifying tires (a set) within the same pattern. Not valid with any other offers. 2. Offer valid in the United States and Puerto Rico to retail consumers and is not valid where restricted, taxed or prohibited by law. 3. A copy of receipt must include the name of the retailer, date of purchase, description and price of product(s) purchased and method of payment. Any rebate applications and original receipts that do not have all of the required information and documentation will not be processed. 4. Any and all claims that do not meet these submission requirements will be rejected. Rebate submissions that include false, altered, or forged purchase information will be considered invalid and fraudulent. All decisions made by Hankook Tire America Corp. are final. 5. Rebate submissions must be postmarked or submitted online 30 days from purchase date. 6. Rebate payment will be sent within 8-10 weeks of receipt of a qualified submission. 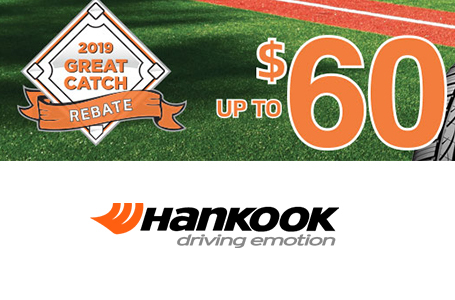 Rebate is issued in the form of a Hankook Prepaid Mastercard. 7. Card is issued by MetaBank®, Member FDIC, pursuant to license by Mastercard International Incorporated. Mastercard is a registered trademark, and the circles design is a trademark of Mastercard International Incorporated. No cash access or recurring payments. Card valid for up to 6 months; unused funds will be forfeited at midnight EST the last day of the month of the valid thru date. Card terms and conditions apply, see MyPrepaidCenter.com/site/Mastercard-promo. 8. To submit or check the status of your rebate go to www.hankooktirerebates.com or check your email. If you have not received information after 6 weeks, please call (844) 618-6947. 9. Purchased tires cannot be returned, or rebate is no longer valid. 10. Commercial, Fleet or Warranty replacement purchases are not eligible for the mail-in rebate. 11. This offer is no longer valid if not fully redeemed within 2 months from purchase date. 12. Hankook Tire America Corp. and its Rebate Processing Center are not responsible for lost, damaged, postage due or misdirected mail. 13. All properties sent as part of the rebate application become the property of Hankook Tire America Corp. and will not be returned. As such, it is recommended that you make photocopies of your rebate submission and all supporting documents.